It’s been five years since Lee McQueen took his life. The exquisite dress worn by Kate Middleton on her wedding day along with the V&A’s fabulous ‘Savage Beauty’ exhibition this year have meant that the name Alexander McQueen has become synonymous with British design. James Phillips’ play, currently enjoying a limited run at the Theatre Royal Haymarket after having been transferred from the West End, comes in the wake of these momentous events. But this offering spotlights the designer differently. It’s an exploration of Lee the man – not Alexander the brand – the imagination, the creative genius and the darkness that went hand in hand with his talent. In an interview with The London Magazine, lead actor Stephen Wight described McQueen the Play as a ‘Dickensian journey through London… back in time’, a dark fairytale about the pivotal moments and relationships in the life of one of Britain’s national treasure’s. 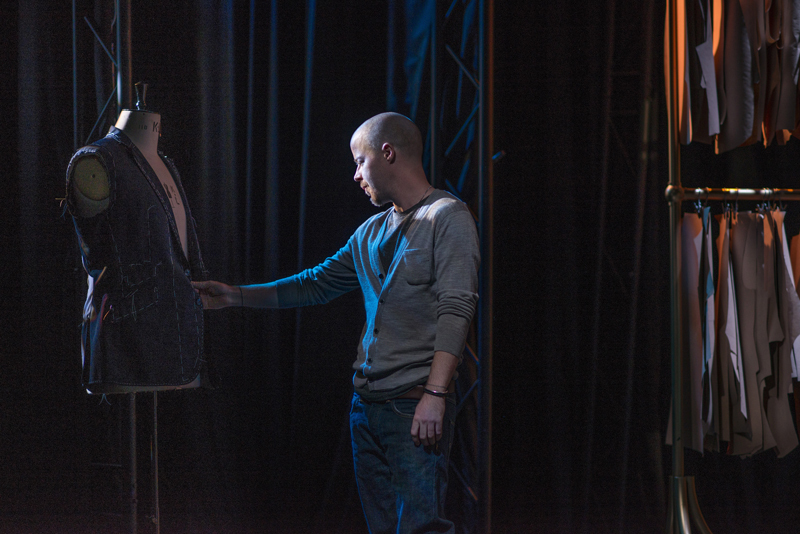 Indeed, from a nostalgic visit to the Saville Row tailor where McQueen learnt his trade, to a poignant meeting with the ghost of his original mentor, Isabella Blow (Tracy-Ann Oberman), James Phillips’ play is packed full of McQueen trivia. Wight, who is literally and figuratively the star of the show, looks astonishingly like the real man with his Celtic colouring, striking blue eyes and close-shaved head, and brilliantly conveys the dry wit and razor sharp mind of Lee McQueen as well. Wight’s comic timing is well balanced with the presentation of McQueen’s emotional turmoil and regularly saves the performance from a script quite dense with clichés. His subtle rendering of the man also served to counterbalance Carly Bawden’s performance, whose character, Dahlia, delivered the majority of the play’s more adolescent lines in a singsong voice, and whose role didn’t come quite as naturally to her as Wight and Oberman’s did to them. 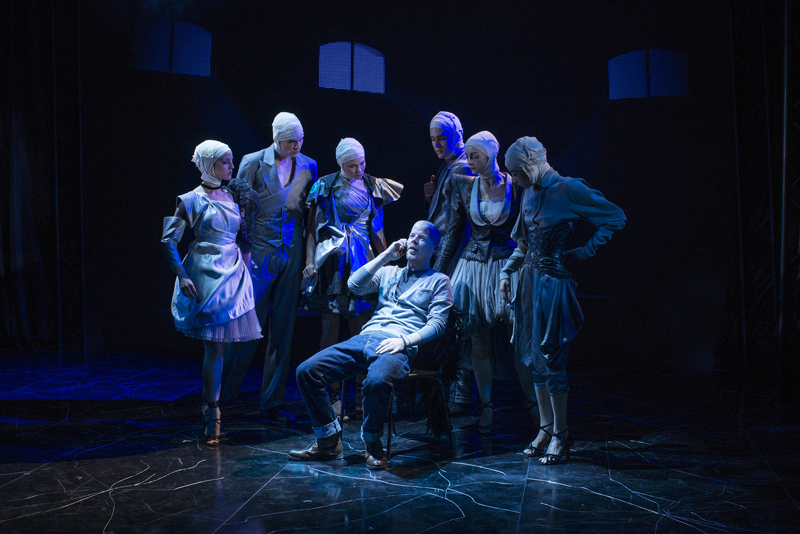 In fact, one of the play’s most successful scenes is delivered by the latter two; an otherworldly meeting between McQueen and Blow in a room decked out with butterflies and a white chaise-long. Wight and Oberman exude chemistry and the result is a very touching exchange, fueled alternately by humour, playfulness and tragedy. In the beginning it’s hard to tell what direction the production is going in – a mixed media dance piece? A musical? A catwalk? Dahlia’s self-consciously casual singing sporadically interrupts the script and I couldn’t really work out why – except that Bawden has a good voice. Contemporary dance, choreographed by Christopher Marney, also punctuates the performance and is inventive and skillfully delivered (though, as a fan of Sadler’s Wells productions, I wouldn’t recommend the play for its dance element alone). But by the end of the play, it’s clear that the production’s unwillingness to be relegated to a particular genre is all part of its relationship with McQueen’s oeuvre. Even the soundtrack is drawn from his catwalk shows. Disappointing is the notable absence of original McQueen designs. The play’s inspiration, his 2008 show The Girl Who Lived in the Tree, is played out in Dahlia’s fanciful claim that she has sat in a tree outside the designer’s studio for eleven days. It’s also there in her thick black, almost triangular bob (as per the models in the catwalk show’s first half), and in the black dress McQueen makes for her – though this came closer to Vivienne Westwood than McQueen in aesthetic. The play uses (from what I could glean) only two other replicas of his designs. The copies are impressively crafted and capture all the theatricality of McQueen’s clothes but going into the show I expected more – isn’t that the allure? However, in retrospect Director John Caird was probably right to avoid the performance becoming an endless catwalk of McQueen’s designs – anyone who visited the V&A’s exhibition knows that it would be hard to compete with. The focus on Lee McQueen the man (as opposed to the big-name brand) is a point drummed home as the narrative exhibits the pressures of artistic ambition and the fashion industry on the designer. It is a powerful story, flashy and theatrical but also dark and tragic and that was how, according to this play, McQueen’s creativity worked. 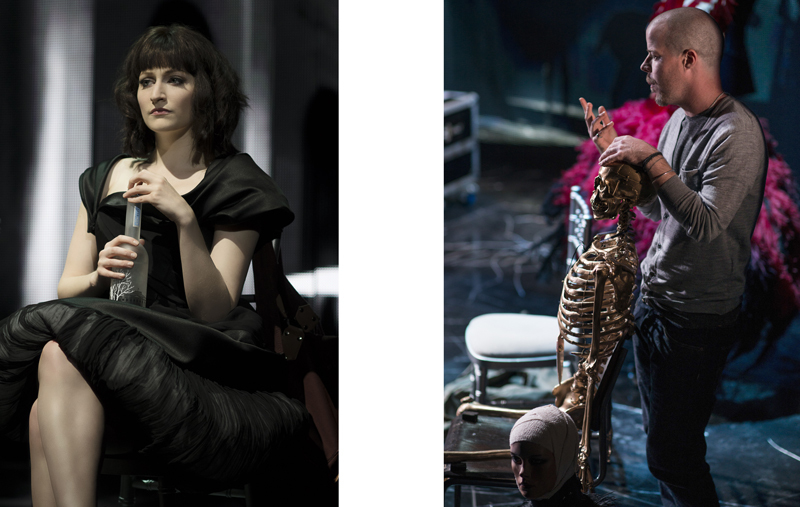 Both Wight and the company’s Dance Captain, Amber Doyle, were keen to tell us that the fusion of theatre, dance, fashion and music in this multi-genre play came directly from an appreciation of McQueen’s shows. It is ironic then, that a central focus of the script is on McQueen’s anger about the assumptions of outsiders who think they might know him after a single ‘Google search’. 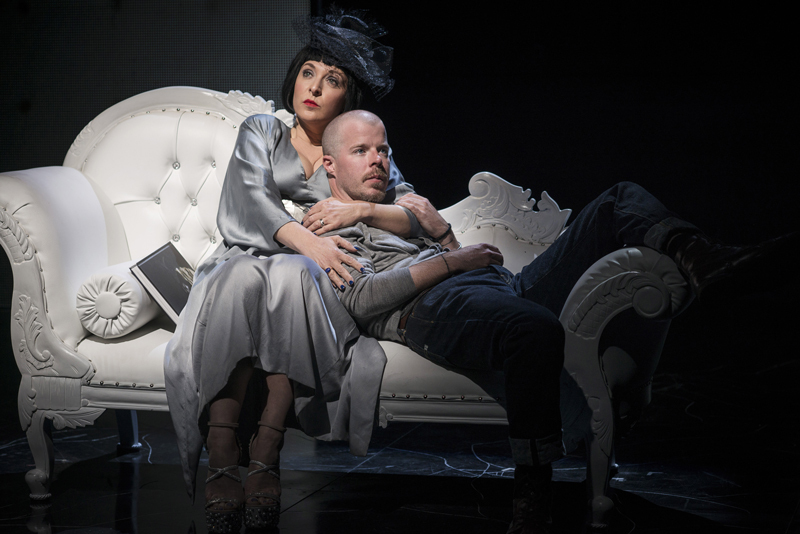 A recurring motif in the play that couldn’t help but prompt me to think that Dahlia, who alternately represents McQueen’s inspiration/subconscious/alter-ego, is a character created on the assumption that we might ever be able to understand what went on in the mind of this troubled genius. 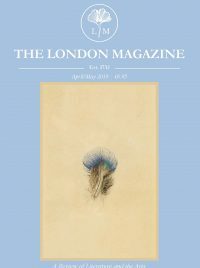 In a metatheatrical twist, it occurred to me that Phillips may have chosen to highlight McQueen’s frustrations with ignorant ‘outsiders’ in order to remind us that even if we leave the theatre thinking we better understand the man behind the craft, Lee McQueen, true to his spirit, would likely come right out and tell us we didn’t.